There are far fewer resources allocated for the care of adult CHD patients than other cardiac patients. As a result, wait times for clinical visits and surgical intervention are much longer than for other cardiac patients – leading to increased anxiety, added risk and even death. There are 15 dedicated centres across Canada to treat adults with CHD (Click HERE to find a centre). There is currently no coordinated plan to transfer the medical records of CHD patients transitioning from pediatric to specialized adult care. Less than half of patients with complex congenital heart defects transition successfully; as a result, many do not receive the care they need. Research in the area of adult CHD has not reached the level of sophistication observed in other areas of heart disease research – even though CHD-related research has the potential for greater impact. At the same time, peer review committees for research funds rarely include adult CHD specialists and frequently mistake the lack of research sophistication for a lack of quality or relevance. 1. 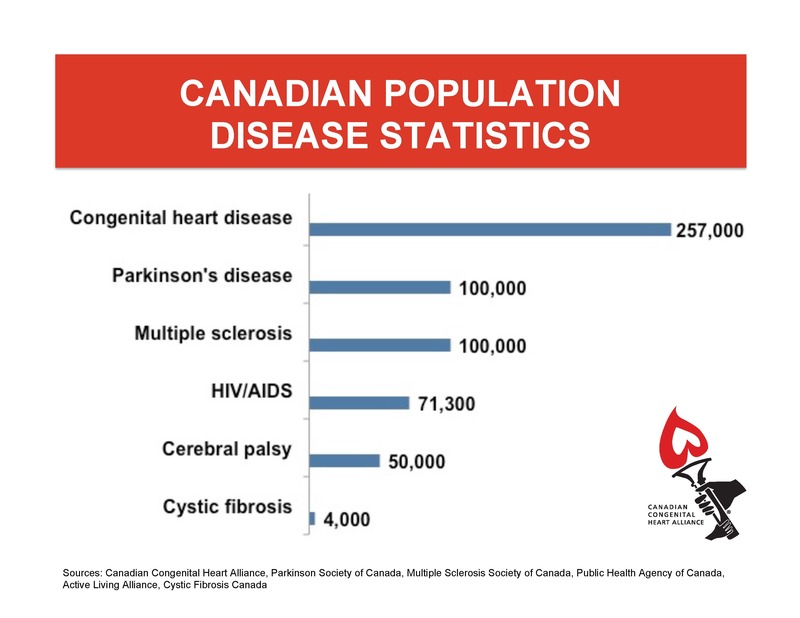 Health Canada Report 2002 – Congenital Anomalies in Canada. 2. Moons P, et al. Temporal Trends in Survival to Adulthood Among Patients Born With Congenital Heart Disease From 1970 to 1992 in Belgium. Circulation 2010;122:2264-2272. 3. Marelli AJ, et al. Lifetime prevalence of congenital heart disease in the general population from 2000 to 2010. Circulation 2014 doi: 10.1161. 4. Beauchesne LM. Structure and process measures of quality of care in adult congenital heart disease patients: A pan-Canadian study. Int J Cardiol 2012;157:70-74.